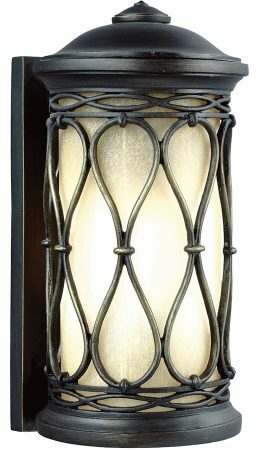 This Feiss Wellfleet small outdoor wall lantern in aged bronze finish with amber glass shade is rated IP44, traditional and features classic period style. Part of the coastal collection, this exterior light features a rectangular wall mount and cylindrical lantern, with classic curving ribbon motif detail and internal amber glass cylinder shade for a wonderful warm light. This traditional outdoor lantern features classic ribbon detail known as an infinity motif which nicely complements the cylindrical lantern silhouette. The Amber glass shade obscures the lamp bulb, nicely diffuses the light and hides any dirt. Made of a proprietary composition, the fixture has exceptional durability to withstand the harshest elements and a 5-year warranty. If you are searching for quality outdoor lighting in a classic style, the Wellfleet should be considered. Fully weatherproof and supplied with a manufacturer’s 5 year anti corrosion warranty, which relates to the corrosion of finishes on composite lights like this one. This outdoor light is supplied by Elstead Lighting and designed in the USA by Feiss, founded in New York in 1955. They have become well known over the years for their contemporary yet classic styling, quality and great original designs like the Wellfleet small outdoor wall lantern in aged bronze finish with amber glass shade you see here.